My husband Tom had a droopy eyelid. His optometrist suggested he see an ophthalmologist. A CAT scan revealed a tumor close to Tom's nose in the orbital area around his left eye. 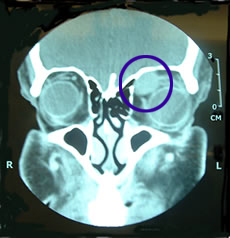 The ophthalmologist initially felt it was a common type of benign tumor and removed it. He mentioned after the surgery that the tumor looked unlike anything he had seen before. Local pathologists were unable to make a diagnosis and and a tissue sample was sent to the Mayo Clinic. Their pathology report indicated that it was a 2 cm high-grade (grade 3 of 4) fibrosarcoma that was incompletely excised. Leave the area alone and deal with the tumor in the event it returns. Completely remove all tissue in the left orbital area. This would be done on an out patient basis and the area would be packed with gauze. Gradually the gauze would be removed over a series of office visits. The first option seemed foolhardy and the second seemed grotesque, leaving Tom with a large hole where his left eye used to be. We left the doctor's office in a daze, and made an appointment with the local oncologist he recommended. The first available appointment was several weeks away. In desperation, I faxed a letter to Dr. Nascimento, the pathologist at the Mayo Clinic who had made the original diagnosis, and asked for his help. He called me within the hour and told me under no circumstances to leave the area alone. The tumor had not been completely removed and when it grew back it would probably metastasize quickly. He also advised me to get Tom to a major cancer treatment center as soon as possible, as time was crucial. He recommended we contact Dr. James Garrity at the Mayo Clinic in Rochester, MN. I also talked with a pathologist at the University of Texas MD Anderson Cancer Center. He spoke highly of Dr. Nascimento's work, and suggested I send a tissue block to Dr. Harry Evans at MD Anderson for a confirming diagnosis. After several phone calls and faxes, within days we were on our way to the Mayo Clinic. The day Tom finished his treatment at Mayo was the same day we would have had our first office visit with the local oncologist.